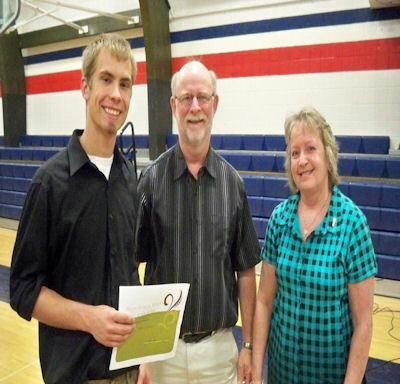 The first Brian Hetrick Memorial Scholarship was announced at West Central's Awards Night May 11th. by the Hetrick family who established this scholarship in memory of their oldest son Brian in the amount of $350 and is to be awarded each year to a graduating senior who plans on attending college. Brian was a 1997 Union High School graduate maintaining a 3.5 GPA. He received over 50 academic and athletic awards including being a member of the National Honor Society and Prom King. He lettered in track, baseball, and excelled in football leading the Yankees defense in most tackles for three seasons, and in receiving his junior year, and chosen Union's first athlete for All-State 1st team as tailback his senior year with over 1750 yards and 24 touchdowns. Brian was a 2001 Monmouth College graduate where he received a BA degree in Business/Finance. He lettered four years on the Monmouth College football team and was captain his Senior year. Brian had many accomplishments throughout high school, college, and his young adult life while always sporting the #35. While succeeding in school and sports he was involved in the community and in numerous leadership roles. His mother Joyce said, "The family of Brian Hetrick hopes the recipient of this scholarship will have a goal and the same commitment as Brian did on everything he achieved in life while always giving 100%." Receiving the award was Mark Mynatt of rural Gladstone, son of Mr. and Mrs. Avery Mynatt. He will be attending Southeastern Junior College while working part or full time to obtain an associates degree in Agriculture and he may either go on to Western Illinois University or he may seek full time employment. the West Central High School Honors Night, typically the first Tuesday in May. Mark Mynatt of rural Gladstone, stand with Jim and Joyce Hetrick. Mark is the first recipient of a scholarship given to a West Central college bound graduate in memory of their son Brian Hetrick.